Observation - Black-headed Gulls - UK and Ireland. 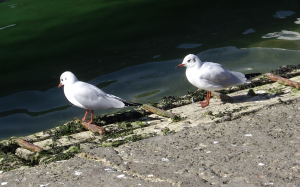 Description: I think these are Black-headed Gull's in winter plumage. Although today in Littlehampton with bright warm sun it does seem a little soon. I think these are Black-headed Gull's in winter plumage. Although today in Littlehampton with bright warm sun it does seem a little soon.